Yeovil Chamber Choir is an amateur chamber choir of about 25 experienced singers from the local area. It was formed in 1993 to provide a platform for performing music that would normally be outside the scope of a choral society. Our repertoire includes both accompanied and unaccompanied music. In addition, we have both commissioned and performed new compositions. 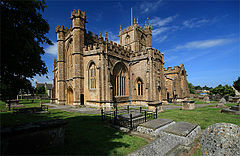 Yeovil Chamber Choir performs a minimum of three concerts a year, usually in local churches.